The promotional Parker Vector Roller ball is simple and robust. A favourite pen since its launch in 1981, the Vector range continues in popularity year in year out. 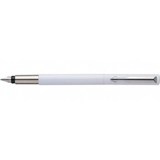 Not only does this promotional pen look very sleek it is very good quality for the price. The Promotional Vector Range boasts the distinctive arrow clip that ensures everyone knows it’s a Parker Pen and the pen is available in a range of four different colours: white, blue, dark blue and dark red. The Parker Pen Company is a manufacturer of pens, founded in 1888 by George Safford Parker in Janesville, Wisconsin, United States. It is currently owned by Newell Rubbermaid. There are various different types of Promotional Parker pens Which Vary from basic to executive – Within these different ranges there are various different textures, colours and styles used to give each individual pen an individual image to meet different expectations for the public. 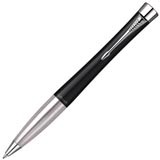 Within the Promotional Parker Pen range there is Promotional Parker Fountain pens, Promotional Parker Ballpoint pens, Promotional Parker rollerball pens, Promotional Parker pencils and promotional Parker pen sets. You are also able to buy Parker ink and refills which are affordable to replace. Another reason why the promotional Parker pen is a great promotional gift is because when using a pen it is nice to use a pen that you feel comfortable with and that writes how you like it too, when you have a great quality pen that satisfies your individual needs it is nice to know that you only have to replace the ink cartridge. All promotional Parker pens branded or unbranded come in an individual gift box this makes the promotional Parker pen a great promotional pen to use as a corporate gift, free give away and to use as company merchandise.